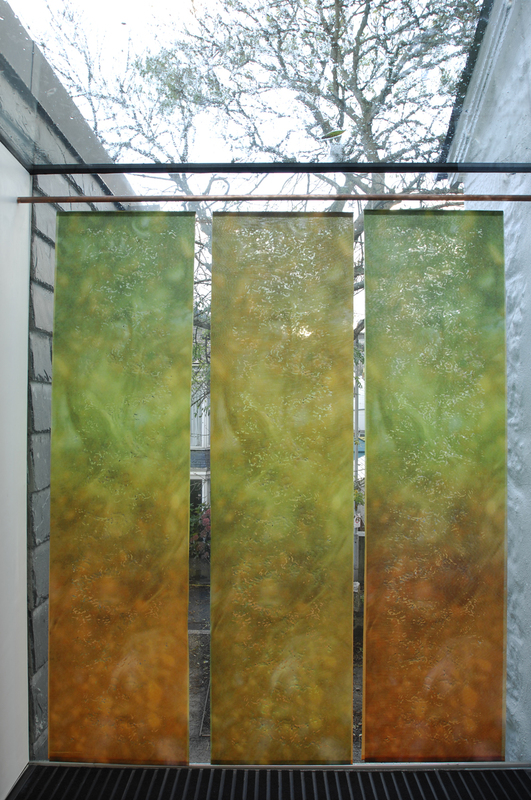 In this series of hanging panels small, repeating glass shapes are layered between copper and steel gauze and silk organza. Fired imagery on the glass encapsulates places and journeys, from the west of Ireland to the agricultural fields of Majorca. 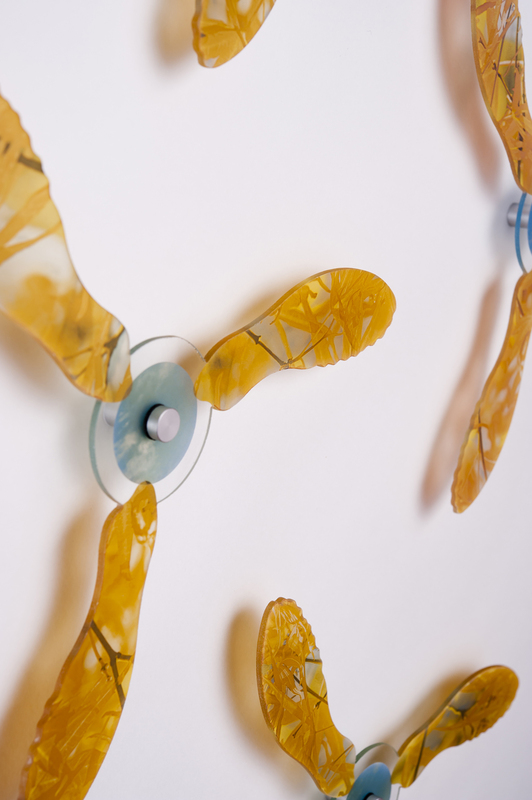 Island Fields is part of a series of wall mounted glass wall panels. The water jet cut shapes, laminated on to clear glass, evolved from drawings taken from OS maps of Bronze Age field systems in West Penwith, Cornwall. Fired on to these are aerial photographs of the Isles of Scilly [Once linked to mainland Cornwall]. A grant from the David Canter Memorial Trust enabled me to take the photographs from a small Cessna aircraft, a magical experience that gave me a completely different perspective on the fragility and changing sea levels of the Islands from above. Penberth was originally made for an exhibition, Lineage, at Newlyn Gallery in Penzance. In researching the places behind the textile designs of Alec Walker in the 1920’s I came across the Penberth Valley near Porthcurno, where a river runs down through woodland to the sea. 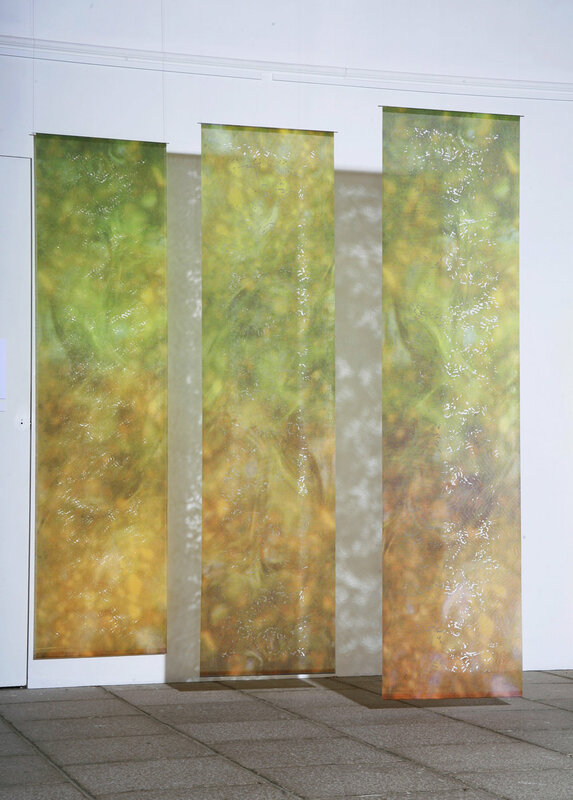 Images of the riverbed were enlarged and digitally printed on to silk organza, and then layered to form a series of hanging panels. I used the same images to laser cut flickering patterns out of the panels, allowing interaction with light and shadows. Waterjet cut and fired glass installation.